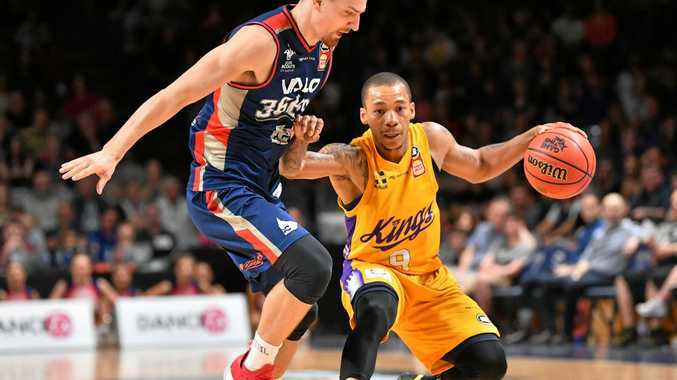 THE Sydney Kings have boosted their finals prospects and smashed a long-standing hoodoo with a 93-81 win over the Adelaide 36ers. Adelaide-born Brad Newley (26 points), former Sixer Jerome Randle (23) and Kings captain Kevin Lisch (20) starred as third-placed Sydney snapped an 11-match losing streak against Adelaide. It was their first win at Titanium Security Arena in 1094 days. Former NBA centre Andrew Bogut proved the perfect supportive foil for the trio with eight points, 13 rebounds, four assists and three blocks. Reserve Adelaide big man Harry Froling scored 15 of his career-high 23 points inside three inspirational minutes during the second quarter, but otherwise the Kings were untroubled. The visitors were focused and red-hot from the outset and stormed to a 16-point lead during the first term, which was delayed while blood was removed from the court after some friendly fire from Bogut's elbow split import David Wear's head open. Sydney led 27-15 at quarter-time before Froling scored all 15 Adelaide points in a 15-7 run to help the hosts slice the margin to 52-43 at half-time. The visitors were eight of 12 from three-point land and continued to be hard to stop as they moved ahead 73-63 at three-quarter-time. Froling again provided punch off the bench in the fourth term but lacked support as Sydney cruised across the line, consigning the seventh-placed 36ers, last season's grand finalists, to their fourth straight loss.